In other countries, no one would have paid much attention to it but here it quickly becomes a big issue. This is hardly the first time an image of a cross has sent Muslim groups into paroxysm. 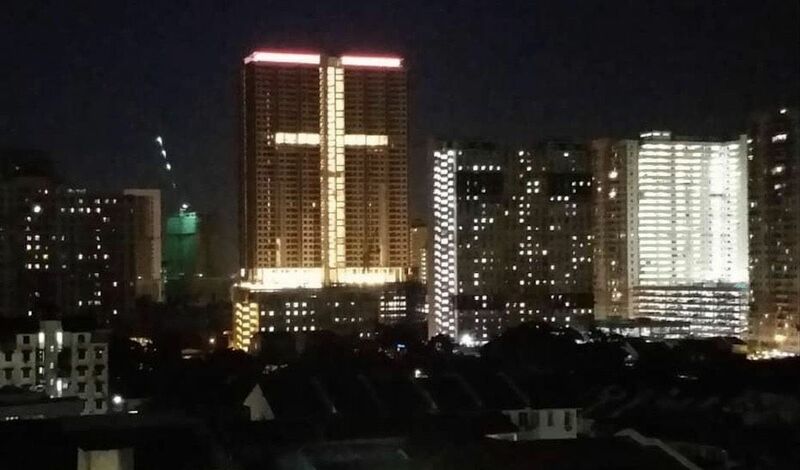 A few years ago, a Muslim group protested against a cross on a church wall in Taman Megah insisting that it was an affront to Muslims and an attempt to subvert their faith. The cross, of course, is not an illegal symbol even in Malaysia and neither is it a proscribed item like the black ISIS flag, for example. How a few lights in the shape of a cross can be seen as such a threat to someone’s faith, an affront to the position of Islam in the federation, something that causes “restlessness” in society and a danger to peace and harmony is simply incomprehensible. And to suggest, as the Penang mufti did, that merely displaying a cross might somehow violate the constitutional injunction against promoting or preaching other religions to Muslims is utterly absurd. Taken to its logical conclusion, it would mean that all crosses anywhere in Malaysia are ultra vires the constitution and must be removed. And what about the statues, images and icons that decorate Hindu, Buddhist and other temples in Malaysia? Would that too be seen as an attempt at trying to convert Muslims or somehow challenging the special position of Islam in the country? To be sure, many Malaysian Muslims would take umbrage at the suggestion that their faith is so weak that it could be undermined by the sight of a cross. The Muslims I know are secure in their faith and laugh at the antics of washed-out politicians like Reezal who are constantly looking for issues to exploit. He ignored the 1MDB elephant (the largest corruption case in our history) right under his nose but he’s quick to make a big fuss over a row of lights that resembles a cross. In any case, if the mere sight of a cross could convert anyone to Christianity, Malaysia would be a Christian country by now because crosses have been a part of the Malaysian landscape for close to five hundred years. The other thing about this whole controversy is how non-Muslims are constantly being lectured about respecting the sensitivities of Muslims and warned not to do anything that undermines racial harmony. It makes no difference, of course, that the threat that all these Malay leaders keep emphasizing is more imagined than real. How on earth can the position of the Malays be threatened when the entire power structure of the country is securely in the hands of the Malays? As I have said before, the so-called “threat” to the position of the Malays is a political construct created to keep the Malay masses subservient to Malay political elites; it is not grounded in reality but in political expediency. In any case, isn’t tolerance and respect a two-way street? Shouldn’t people like Reezal extend the same courtesy to non-Muslims that he expects them to extend to Muslims? Imagine the uproar, for example, if a non-Malay politician called something Islamic “an eyesore” as Reezal did when referring to the cross-shaped lights in Penang. How dare he refer to a cross in such a derogatory manner? Shouldn’t all those concerned with peace and harmony in the country take him to task for his demeaning and bigoted remarks? Surely, maintaining peace and harmony in the country is the responsibility of all Malaysians – Malay and non-Malay, Muslim and non-Muslim – rather than just minority communities. Some would suggest that it is, in fact, incumbent on the majority to set the tone for peace and harmony in the country.